Here's my latest Cinema Saturday card. Can you tell what movie they picked this week?? That's right - TWILIGHT!! Sure, Edward doesn't wear a cape, and his hair is WAY more stylish than this - but I just couldn't resist pulling out my favorite little vampire stamp!!! It's from a Westrim Crafts set called Spooky that I found on the clearance rack at Archiver's just after Halloween last year, so I'm thrilled to be getting him inky for the first time. You see, I *love* vampires!! It's a little known fact about me. (although, if you read this blog regularly, this is not the first time I've admitted it!!!) However - Twilight - well, I resisted reading it for the longest time. No offense to some of you, but I just thought it was a little creepy that all these middle-aged women were in love with a teenage vampire!! But then I thought more about it - wait! He's a vampire! He's probably been seventeen for a very long time, so really, he's MUCH older. Oh. But that means he's like a hundred year old vampire hot for a seventeen year old girl. Still creepy. But then I decided - who cares - he's a vampire and I love vampires!!! hee hee So I actually just finished the first book the other day, and watched the movie when I knew this would be the challenge this week. I really do like it - but I'm not going to claim to be one of the FANATICS out there. I just love all things vampire!! (ok fine I'll admit it - Edward is totally dreamy!!) Well anyway, I had a super fun time making this card!! One thing in Twilight that's different than the other vampire books I've read is how she dealt with them going out in sunlight - she has them SPARKLE in the sun!! So my little vampire has a super sparkly face, thanks to my Stardust Gelly Roll pen. There's also sparkle on the chipboard heart (Christmas Red Stickles) and the hearts on the DP are sparkly too. I also colored over the vampire's hair, cape and shoes with my black Glaze pen, so he's sparkly AND shiny! I used this week's Mojo Monday sketch for the card, which was awesome as always, and as luck would have it a Verve sentiment fit with my theme quite nicely! So there you have it, my sparkly vampire card and my confession about my love for vampires, which began long before they were sparkly teenagers. Yes, I am a weirdo. 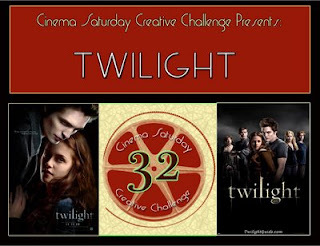 :-) FYI you have until Thursday 9pm PST to play along with Twilight! You know you want to!! ;-) Thanks for stopping by today!! Libby - YOU SOOO Rock!!! Can I just tell you that I was just cracking up reading your post!! Seriously - you are hilarious!! Love the little comments about the creepiness of middle aged women/teenage vampire vs. the creepiness of a hundred year old vampire with a teenage girl!! hahhahahah!!! LOL!!! And I love your confessions! 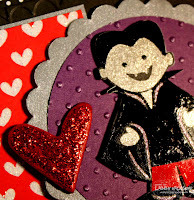 Your little vampire is just the cutest thing ever - LOVE that you made his face sparkle - like in the movie - and I totally love the color combo and the sparkle sparkle bling bling you got going on!!! You rocked Julee's Mojo Sketch and I love the sentiment! Thank you so much for playing along this week!!! I love it when you and your sister and your brother get involved in the guessing - love the family affair that it becomes!!! Your card simply rocks! Sending you hugs, wishes for prolonged clean desk spaces and wishes that everyone takes a long nap tomorrow for mummy! PS - sorry that this comment is more like an essay :) see you on fbk! hugzzzzzzzzzzzzzzzzzzzzzzzz! I just love your sparkly vampire!I thought it was neat that that she made them sparkle in the sunlight. Your card is awesome, as usual! Wow, not only an amazing card but more information about vampires than I thought I'd get with breakfast! I love all the bling and you rocked that sketch! Your card is too fun, great bargoooon on the stamp! The sparkly vampire is WAY TOO CUTE! I love the card. You say your not a fanatic yet...just wait. Book 2 is hard to read, but book 3 and 4 are my FAVS and that is when you will be a true fanatic. Keep me posted on the reading...I would love to discuss the books. This is just the cutest, Libby!! You've rocked those challenges!! I love the sparkly vampire!! He rocks!! 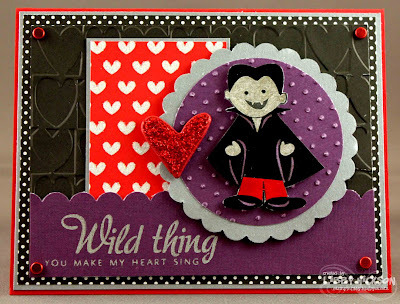 Your vampire card looks terrific, love all the glittery on him! Cute card! I like how you made him sparkle. I was skeptical about Twilight, too, but all those middle aged women kept raving... Finally, I decided to try one of the books, but the friend who was going to loan them to me kept forgetting. Well, I watched the movie and I loved the concept, including the sparkles! And I LOVE how you focused on that to make your card really super duper for this challenge! Way cute, Libby! this is such a fun card Libby! Love the glitter too. oh too funny! Love it! What a fun card! lol! that is so cute great card!